The great success of E. W. Hornung’s Raffles stories which first started to appear in 1898 and the popularity of translations of Maurice Leblanc’s tales of Arsène Lupin at the end of the following decade established the gentleman thief as a lucrative fictional subject. In the 1920s another similar character made his literary debut. This character was Blackshirt, created by Bruce Graeme. 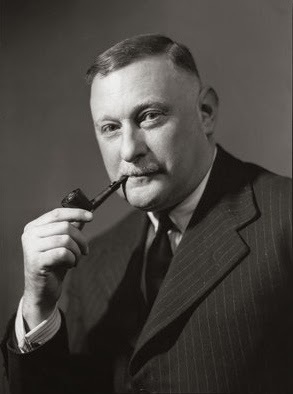 Bruce Graeme was the pen-name of Graham Montague Jeffries (1900-1982), a prolific author of both mysteries and thrillers under a variety of pen-names. His first Blackshirt story was published in 1923 and a collection in book form, with the title Blackshirt, followed in 1925. It was to be the first of many Blackshirt books. While both Blackshirt and his creator are now almost entirely forgotten their success at the time was considerable, the first two books in the series eventually selling around a million copies each. Alias Blackshirt was the fourth book in the series. At this point it should be explained that the hero’s sobriquet has nothing to do with the Italian fascists, although it may have been chosen by the author as a kind of topical joke. The name derives from the hero's habit of wearing all-black clothing and a black mask. Blackshirt, whose real name was Richard Verrell, differed in several important ways from his gentleman thief predecessors. For one thing, he was no gentleman. He was an orphan, a slum child brought up in the midst of the criminal underworld. At an age when most boys are learning to ride a bicycle he was learning the fine art of burglary. Blackshirt was not however destined to remain a criminal. That he becomes a reformed character is not a spoiler, but the reasons for his reformation and the way in which it occurs are major spoilers which I do not intend to reveal. Suffice to say that London’s most notorious burglar transforms himself into a successful and respectable writer. A writer of, needless to say, crime novels. Had this been the end of the story there would have been only one Blackshirt book. In fact Blackshirt cannot escape the world of real-life crime but rather than returning to his bad old habits he becomes an amateur crime-fighter. In Alias Blackshirt his past catches up to him in a rather surprising way. Another series of daring burglaries baffles Scotland Yard. The crimes bear the unmistakable stamp of Blackshirt and in fact the thief is spotted during one robbery, wearing the outfit that had made him so notorious. This is more than embarrassing for Richard Verrell as he knows very well that he had nothing to do with this new series of robberies. It is obvious to him that someone is committing these crimes with the intention of making them appear to be his work. It might be obvious to him but it is not at all obvious to Scotland Yard. They are convinced that Blackshirt is back to his old tricks. The most alarming thing of all is that the latest robbery took place at a time for which Richard Verrell can provide no alibi whatsoever. It seems that his criminal past is about to be exposed. There is only one solution. Richard Verrell must turn detective and track down the new Blackshirt. There is a further difficulty. His namesake is blackmailing him into assisting him in this new series of burglaries. The thriller genre was becoming immensely popular in the mid-1920s. The Bulldog Drummond books, which started to appear in 1919, were sensationally successful. Edgar Wallace’s thrillers were selling in enormous quantities. John Buchan’s Richard Hannay and Edward Leithen spy thrillers were hugely popular. The Blackshirt stories are rather different, and in some ways point the way forward to the hero-rogues of 1930s thrillers, such as Simon Templar and The Baron. Like them Blackshirt combines the glamour of the successful criminal with the virtuousness of a hero. And like Simon Templar (and like Raffles a quarter of a century earlier) his social position is ambiguous. Richard Verrell has the fame and the money to mingle with high society but he remains an outsider, always aware of his lowly origins and his criminal past. He is actually more shamed of his origins than of his earlier career as a burglar. Success could bring a measure of acceptance among the upper reaches of society, but this acceptance would always be partial. Richard Verrell is still aware of his outsider status. One interesting feature of most of the British thrillers of the interwar years is that they really need to be read in sequence. It is particularly important in the case of the Blackshirt books to at least read the first book before attempting any of the later entries in the series. As is the case with Bulldog Drummond, The Baron and The Saint the first book gives crucial background information without which the characters cannot be properly understood. The British thrillers of the 20s and 30s remained popular until the 1970s, after which they began to lapse into obscurity. This is a great pity since these books not only offer fine entertainment but also a glimpse into another world, a world far more complex and fascinatingly contradictory than is generally acknowledged. Alias Blackshirt is a fine example of the breed. Highly recommended, but do read the first book in the series before reading this one. 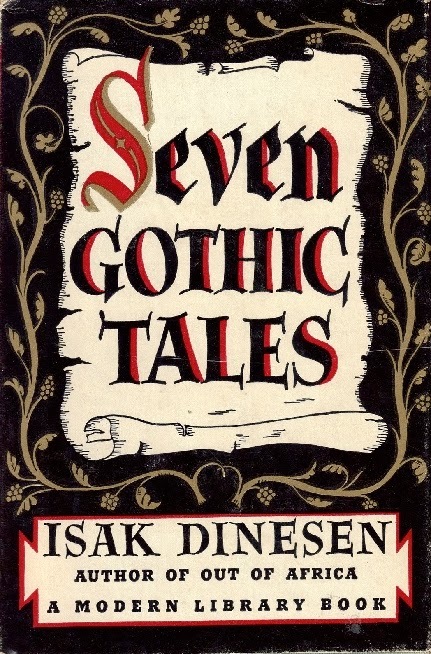 I read the first four stories in Isak Dinesen’s Seven Gothic Tales several years ago. I have no idea why I then put the book aside, since I liked those stories quite a bit. I’ve now read the last three tales in the collection, and I’m even more impressed. Isak Dinesen is probably better known today under her real name, Karen Blixen, thanks to the success of the 1980s movie version of her book Out of Africa. Karen Blixen was born in Denmark in 1885. She lived for some years in Kenya, returning to Denmark in the 1930s. She died in 1962. Seven Gothic Tales, published in 1934 when she was 49 years old, was her first book. Oddly enough, although she was Danish she wrote in English. She then translated them herself into Danish. Even more confusingly, her books were published in some countries under the name Isak Dinesen and in other countries under her own name. Although they are described as gothic tales don’t expect the usual gothic clichés (although ghosts do make an occasional appearance). In some ways her writing resembles that of the magic realists, but it’s a very subtle kind of magic realism. Odd things sometimes happen, but they’re never bizarre or spectacular odd things. They’re just enough to let you know that Dinesen has no interest in the kinds of naturalism or social realism that were approved by literary critics at the time she started writing. Her plots are intricate and often involve stories within stories, or in the case of The Dreamers stories within stories within stories. She is fascinated by the stories we tell about ourselves, and the way we define our personalities according to the way others perceive us. The Supper at Elsinore tells of two sisters and the brother who disappeared many years before. From time to time they hear tales of him, tales which may or may not be true. In his absence he dominates their lives to a greater extent than he could ever have done by his presence. The Poet is the story of a man who, when young, had literary ambitions of his own. He has now abandoned ideas of writing and seeks to fulfil those ambitions by nurturing a young poet, and by creating this young man as his own invention, as a kind of work of art. The Dreamers, a magnificent story, unfolds like a series of Chinese nested boxes, and tells the story of a woman who may or may not be three other women. Seven Gothic Tales was a stunning literary debut, and I can’t recommend it too highly. The Venner Crime, published in 1933, was one of John Rhode’s many detective novels featuring the amateur scientific detective Dr Priestley. John Rhode was one of a number of pseudonyms used by prolific English crime novelist Major Cecil John Charles Street (1884-1965). This is the third of the Dr Priestley novels that I’ve read so far and I’m finding them more and more to my taste. The novel starts with a disappearance rather than a murder. In fact, though there are several sudden deaths it’s not until very near the end of the book that Dr Priestley can be certain that any actual murder has occurred. Even the disappearance does not initially seem all that sinister. The vanished man is a young man named Ernest Venner. He had told his secretary he’d be away for a few days and then later the same afternoon told his sister (with whom he lives) that he’d be back later that night. If he had intended to disappear why would he tell one person he’d be gone for some days and tell someone else he’d return that evening. It’s these tantalisingly minor discrepancies that arouse Dr Priestley’s interest. The most suspicious circumstance is that Venner’s uncle, Denis Hinchliffe, had died suddenly under curious circumstances shortly before Venner’s vanishing act. Hinchliffe’s symptoms strongly suggested strychnine poisoning. Dr Priestley’s friend Dr Oldland was not satisfied the death was due to natural causes and refused a death certificate. A subsequent post-mortem carried out by the distinguished Home Office pathologist Sir Alured Faversham (also an old friend of Priestley’s) established beyond doubt that there was no trace of strychnine in the body and that death was due to tetanus. Hinchliffe had been a very wealthy man and both Ernest Venner and his sister Christine were hoping to inherit his fortune, Hinchliffe having no other family. The hoped-for inheritance certainly provides a strong motive and Hinchliffe’s death was very fortunate indeed for Ernest Venner who was in very serious financial difficulties. But the post-mortem ruled out murder fairly conclusively. There’s still the matter of Venner’s disappearance and when several weeks pass without any trace of the missing man the possibility that he has been murdered has to be considered. On the other hand a man might well wish to disappear if he has committed a serious crime, although in this case his uncle’s extraordinarily fortuitous death was due to natural causes. A body is eventually discovered, but it is not the body of Ernest Venner. In fact it seems to have little connection with Venner’s disappearance, apart from a few details that could be explained by coincidence. Dr Priestley is inclined to believe that innocent coincidences are quite possible, but he is also aware that not all coincidences are so innocent. Although he is less well remembered than some of his contemporaries John Rhode’s Dr Priestly detective novels were extremely popular in the 1920s and 1930s. Since only a handful were ever published in paperback surviving copies can be a little on the expensive side. Rhode was one of the author’s dismissed by critic Julian Symons as belong to the “humdrum” school of detective fiction. To some extent I can understand Symons’ reasoning, especially given his own preference for psychological crime novels. The Dr Priestley novels are very much of the puzzle-solving type and the atmosphere can be rather genteel (although Dr Priestley Investigates features quite outrageously extravagant plotting). Personally I’m inclined to regard those aspects of his writing that Symon disliked as features rather than bugs. While Dr Priestley can be a little of the gruff side these novels are essentially civilised intelligent entertainment. Those who prefer their crime fiction uncivilised are probably not going to enjoy them. And, sadly, crime fiction has become increasingly uncivilised since Rhode’s heyday. I find Rhode’s style to be pleasing, with just enough dashes of erudition and sophistication. Rhode can certainly not be accused of failing to play fair with his readers. His clues are all hidden in plain sight and the eventual solution to the mystery is eminently logical (Dr Priestley being a profoundly logical sort of fellow. It should perhaps be noted that Dr Priestly is a scientist rather than a medical doctor. He’s rather in the style of R. Austin Freeman’s Dr Thorndyke, putting his trust in science and logic rather than intuition. The Venner Crime is a fine example of the English golden age detective story at its best, with strong plotting and a detective hero with just enough inherent interest to avoid blandness but without being deliberately eccentric to the point where his eccentricities would overshadow the plot. A thoroughly enjoyable read. Highly recommended. Berkeley Gray’s Mr Mortimer Gets the Jitters, published in 1937, introduced British thriller fans to yet another new thriller hero, a young man with the unlikely name of Norman Conquest. On the surface Norman Conquest is very much a Simon Templar clone, but appearances can be deceptive. Berkeley Gray’s real name was Edwy Searles Brooks and he had been churning out stories in prodigious quantities for boys’ newspapers for many years. Norman Conquest is in fact a later version of a character Brooks had created twenty years earlier, long before Leslie Charteris’s emergence on the thriller scene, and in fact even before the first Bulldog Drummond novel appeared. Brooks was a writer of an earlier generation and he had seen writers like Charteris achieve success on an unprecedented and international scale. He decided that since he’d been doing this sort of thing for decades it was only reasonable that he should get a slice of the action, which is what he proceeded to do. Norman Conquest is unquestionably a hero in the Simon Templar mould. Charteris certainly deserves the credit for recognising the potential of a new style of hero. Norman Conquest is a bit like Simon Templar on steroids. And speed. Brooks did not quite have Charteris’s polish or style but he made up for it with sheer excess and breathtaking pace. 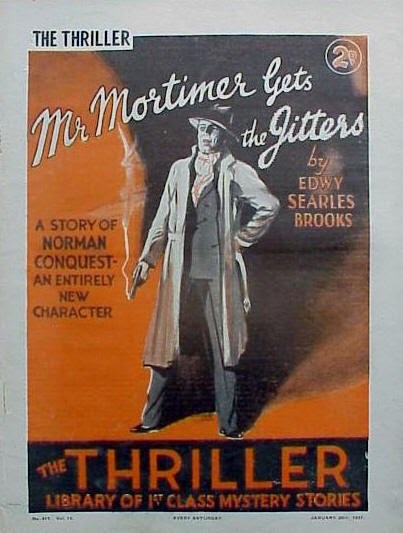 Mr Mortimer Gets the Jitters is moderately long as 1930s thrillers go but it is in fact three adventures in one. The hero sets out to deal with one diabolical criminal mastermind only to find that he is actually up against three master criminals, and he then sets about dealing with each one in turn. As a result it packs enough action for three novels into one novel. It hits the ground running and the pace never lets up. To begin with Norman Conquest merely intends to relieve one crooked businessman of a large share of his ill-gotten boodle. He believes that Geoffrey Mortimer cheated his late father out of his business, so now it is only fair for him to cheat Mr Mortimer out of a sum roughly equivalent to the value of his father’s business. A hundred thousand pounds (an immense fortune in 1937) would do nicely. Conquest soon discovers that Mr Mortimer is much more of a villain than he’d suspected. Mr Mortimer is in fact a criminal on a vast scale and of a very unsavoury sort. Simply relieving Mr Mortimer of a fortune is now no longer enough. Conquest has found his true calling - to be not only a daring outlaw but also a crusader against evil. Mr Mortimer is a nasty piece of work, but he is only a subsidiary villain. He is not the Mr Big. In fact he is only the number three man in a criminal empire of vast scope and Conquest wants to bring down the entire criminal organisation. Conquest’s determination to do so grows as he discovers the organisation’s involvement in drugs and that most horrifying of all villainies, white slavery! It might seem unlikely that one man could destroy such a far-reaching criminal empire but Norman Conquest is no ordinary man. And having relieved Mr Mortimer of considerably more than the hundred thousand pounds he’d originally intended Norman Conquest is now a very rich young man. He has also acquired a side-kick, a young woman named Joy Everard who not only wins his heart but proves to be a very valuable and capable ally. Norman Conquest has a fondness for gadgets that makes him an early predecessor of James Bond. He also has an uncanny knack for escaping from apparently hopeless predicaments, which is just as well since he is constantly landing himself in such predicaments. In some cases he deliberately walks into traps, relying on his wits and his supreme self-confidence to find a way out before death can catch up with him. Like the Saint he takes a great deal of pleasure out of baiting his enemies, employing a kind of psychological terrorism against them. His reasoning, which is sound enough, is that it is useful to make his enemies think that he is sublimely unafraid of them and to make them feel that they should be very afraid of him. His methods involve a good deal of out-and-out bluff, but bluff backed up with a supreme confidence that by the time his bluff can be called he will have come up with something to justify his bravado. Mr Mortimer Gets the Jitters is a non-stop roller-coaster ride of action, thrills and wise-cracks. Maybe Norman Conquest doesn’t quite succeed in out-Sainting the Saint but he gives it his best shot and the results are hugely entertaining. The early Norman Conquest novels are unfortunately quite difficult to come by, being long out of print and with used copies fetching rather high prices. In his excellent critical study of the thriller genres, The Durable Desperadoes, William Vivian Butler points out there are five quite distinct phases in the career of Leslie Charteris’s The Saint. The first three phases occurred during the 1930s, the fourth was the wartime Saint, and the final phase began in the late 40s. The Mark V Saint was a very different character to any of the earlier versions. So far I’ve been confining my attentions to the early incarnations of Simon Templar. 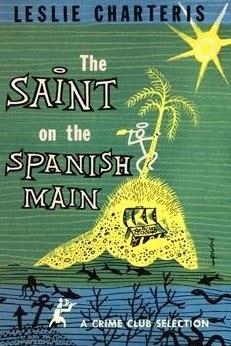 The 1955 short story collection The Saint on the Spanish Main represents my first exposure to this Mark V Saint, and it’s rather startling. For one thing, The Saint is now very much a loner. In his earlier versions Templar was always the leader of a gang. Not a gang of criminals, although Simon’s activities were often borderline illegal, and in some cases quite blatantly illegal. The Saint’s followers in the first books, from the early 1930s, are more like Robin Hood’s band of Merry Men, and he even had his very own Maid Marian in the form of Patricia Holm. This early Saint was very much a team player, and given the scale of his operations he needed to be. The Mark V Saint not only works alone, he lives alone. He lives mostly in hotel rooms. His lifestyle is glamorous and lavish and he is never short of feminine company for very long but at the same time there is a subtly air of melancholy about him. This is no longer the outrageously exuberant larger-than-life Simon Templar who seemed possessed of inexhaustible energy and an equally inexhaustible capacity for irrepressible schoolboy humour. There is no question that this is a slightly older Simon Templar and that he is a sadder but wiser man. As Butler also pointed out in his book Leslie Charteris made a conscious decision to scale down The Saint. He is no longer battling diabolical criminal masterminds and the fate of civilisation itself no longer hangs in the balance. Simon Templar’s life is as adventurous as ever but the adventures are on a smaller scale. To have even as redoubtable a hero as The Saint battling evil on an epic scale entirely alone would hardly have been convincing. His adventures are now of the sort that a solitary world-traveller can easily cope with. The whimsicality is still there, but it’s a gentle whimsicality. Simon Templar still finds that the world provides a great deal of amusement but it’s no longer the amusement that an overgrown schoolboy would find. It is the amusement of a sophisticated, intelligent and rather thoughtful man. He is still a youthful figure but he is clearly now much closer to middle age, although we can be sure it will be a vigorous and lively middle age. Simon Templar has certainly not turned over a new leaf. He still dabbles in crime, although as always his victims are villains who thoroughly deserve to be fleeced. Charteris has not lost any of his old skill. He has merely adapted his skills to changing times. He has created a Saint who is as much at home in the world of the 1950s as his earlier incarnation was in the world of the early 1930s. Thriller writers are not renowned for character development but that is what Charteris has attempted, and rather successfully. The Simon Templar of the 1950s is the sort of man that the Simon Templar of the 1930s might well have grown into, more reflective and slightly less reckless, but with the benefit of age and experience. Having The Saint island-hopping through the Caribbean provides perfect settings for adventures, and the adventures come thick and fast. Simon Templar finds himself searching for sunken treasure (The Old Treasure Story), foiling a revolution in Jamaica (The Black Commissar), solving an ingenious murder (The Arrow of God) and getting the better of some rather nasty villains (The Unkind Philanthropist and The Effete Angler). In The Questing Tycoon he discovers that there’s rather more to voodoo than he’d thought. Charteris uses the settings with skill and as more than just colourful backgrounds. The 1960s TV series The Saint is very similar in tone to this short story collection. On the whole I think I prefer the Mark II Saint of the early 1930s but The Saint on the Spanish Main is an intriguing collection. Charteris was a master of the short story form, a form which he always preferred. Highly recommended. Margaret Gabrielle Vere Campbell Long (1885-1952) was a prolific English author who wrote under half a dozen pseudonyms. She is best remembered for the books she wrote as Marjorie Bowen. Her work was admired by Graham Greene and continues to enjoy a high reputation among fans of romance and gothic fiction. She also wrote mysteries under the name Joseph Shearing, including For Her To See which was published in 1947. In the US it was published as So Evil My Love. 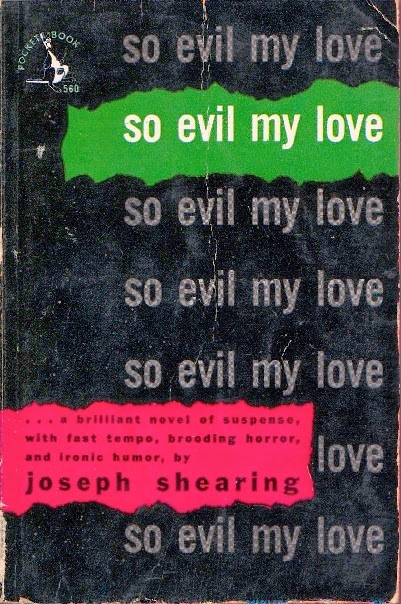 While So Evil My Love is undoubtedly crime fiction it is not a detective story. The identity of the murderer is never in doubt. It relies mainly on suspense, and even more on the author’s ability to create complex characters with contradictory motivations. The characters themselves often do not fully understand their own motivations and live lives based on self-deception. Mrs Olivia Sacret is the widow of a Dissenting clergymen who had gone to Jamaica as a missionary, where he had died after a lingering illness. On her return to England Mrs Sacret finds that her husband left her very poorly provided for. Even worse, she discovers that she possesses neither the social connections nor the skills to obtain any kind of decent paid employment. In desperation she decides to look up the only real school friend she ever had. Susan has recently married for the second time, to a young banker named Martin Rue. The marriage is not a happy one. Martin Rue is a hypochondriac whose only interest in life, apart from his health, is growing exotic flowers. He is not really a bad man but he is ill-tempered, insensitive and miserly. He is constantly finding fault with his wife. His mother is a particularly unpleasant woman who makes her daughter-in-law’s life a misery and is intent on wrecking his marriage. Susan herself is frivolous, weak-willed and unintelligent. Mrs Sacret discovers, quite by accident, that she has a hold over Susan. Susan had been the subject of malicious gossip over her relations with a married man and had written a series of letters to Mrs Sacret on the subject, letters that could at best be described as indiscreet, at worst as compromising. Susan immediately assumes that Mrs Sacret is intent on blackmailing her. Such a thought had never occurred to the pious widow of a missionary. Mrs Sacret would never dream of stooping to blackmail, but when Susan offers her a position as companion she accepts. Mrs Sacret soon coms to dominate Susan completely. She still does not think of herself as a blackmailer although in practice that is precisely what she has become. Mrs Sacret has no difficulty in finding ways to justify her actions to herself and when she becomes enamoured of a handsome painter he encourages her to take whatever advantage she can of the situation. The situation becomes increasingly fraught and eventually ends in murder. The murder appears at first to be a case of suicide but the coroner’s jury returns an open verdict and there are those who are very dissatisfied by the assumption of suicide. The matter will not be allowed to rest. While there is plenty of suspense the novel’s strong suit is the merciless dissection of the personalities and motives of the leading characters. Mrs Sacret had been an inoffensive and rather insignificant woman who succumbed to temptation. Having done so she becomes increasingly corrupted by her own actions. Susan is also a weak character although she is weak in very different ways compared to Olivia Sacret. Martin Rue is yet another weak character, excessively dominated by his mother and unable to bring himself to take the steps he needs to take in order to save his marriage. These are not evil people as such, but weakness of character can lead to evil results. Weakness can have a corrosive effect on the personality and it can set in motion a self-reinforcing cycle that leads ever further downwards. The author’s style is at times playfully ironic but the irony can at times take on a much harder edge. She is extremely adept in her depiction of the dangers of self-deception. So Evil My Love is a gripping and skillful psychological crime novel and is highly recommended. Englishman John Creasey (1908-1973) may well be the most prolific author who has ever lived. He had at least 562 novels published during his lifetime and most authorities believe the actual total was over the six hundred mark. Creasey wrote under his own name and under no less than twenty-eight pseudonyms. 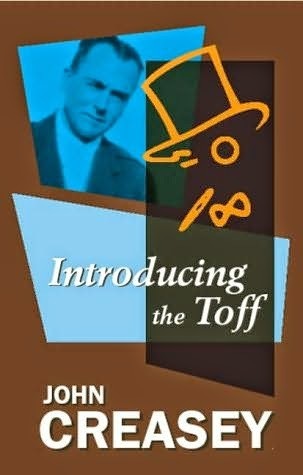 The Toff was one of his most enduring series characters, featuring in fifty-nine books. The Toff made his first appearance in print in a story called The Black Circle written for Thriller magazine. The story was later enlarged to novel length as Introducing the Toff, published in 1938. The Toff is a variation on the gentleman desperado amateur crime-fighter thriller hero made popular by characters like the Saint, Blackshirt and Bulldog Drummond. Like these other heroes the Toff often operates outside the law whilst always remaining on the side of justice. The Toff is slightly unusual however in being an actual aristocrat, something that sharply differentiates him from the Saint. The Toff is actually the Honourable Richard Rollison. Like Bulldog Drummond and the early version of the Saint the Toff has a number of associates who assist him in the course of his crime-fighting activities, although the only one who makes an appearance in this first novel is his manservant Jolly. Jolly will later become a fully fledged sidekick, and a very competent one, but at this stage he still remains very much in the background. In Introducing the Toff Creasey tells us that at the time Richard Rollison left Cambridge University he had a fortune of half a million pounds and a very decided taste for adventure, a taste he indulged in the disreputable quarters of various cities in various continents. Having returned to England he has become the scourge of the London underworld and something of a legend in the East End. He is feared for his ruthlessness and efficiency but he has also started to acquire a different sort of legend, as a man who always plays fair and is prepared to stand by any man who offers him help in his implacable war on crime. The Toff lacks the larger-than-life quality of a Bulldog Drummond and the mischievous wit of a Simon Templar. At first sight he does not appear to be a very formidable opponent, being slight in build and somewhat unassuming by nature (at least in comparison with Bulldog Drummond and the Saint). This is perhaps one of the reasons he has become so feared - criminals who get on the wrong side of him quickly discover that he is far more dangerous than he looks. There is something uncanny about a slightly built rather quietly spoken gentleman-about-town who is a crack shot and is equally deadly with a knife or in unarmed combat. Like the Saint the Toff has a distinctive calling card with a drawing of a top hat, a monocle and a cane in place of the Saint’s famous stick figure. This first Toff novel opens with an encounter with a mysterious gunman on a lonely road, an encounter which almost brings the Toff’s career to an abrupt end. He has decidedly the worst of the encounter but he is not overly bothered by this. He sets about tracking down the gunman with his usual quiet determination. Rollison has in fact stumbled upon an international drug-smuggling ring, and a number of very dangerous enemies including a sinister Egyptian and a trigger-happy Chicago hoodlum. There is of course a heroine in distress as well, although the Toff has to admit to himself, somewhat reluctantly, that she may not be as innocent as she appears. The Toff is more inclined than most thriller heroes of his era to work with the police, or at least to co-operate with them. While we have no doubt that the Toff will eventually triumph he gives us some anxious moments along the way, especially when he manages to get himself blown up. The Toff is quite happy to admit that he is capable of making mistakes, a quality that makes him a rather endearing hero. He lacks the sublime self-confidence of the Saint but he also lacks the Saint’s arrogance. The Toff’s great strength is his quiet doggedness. The most extraordinary thing about Creasey is that despite the truly incredible pace at which he wrote (he once claimed to have written two novels in a week) there’s nothing slapdash about his writing. He was an unbelievably fast but also highly disciplined writer. He was also able to create complex and interesting heroes. There’s as much action as you could wish for in a thriller. The Toff of this first novel is not yet a fully developed character but he’s already pretty interesting. It seems that most of the great British thriller series of that era really need to be read in sequence. Like the Saint the Toff evolves somewhat in subsequent books. On the whole a highly enjoyable read. Definitely recommended. 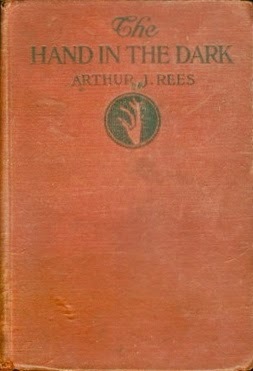 Arthur J. Rees’ The Hand in the Dark was published in 1920. It’s a little-known but interesting example of the golden age detective novel. Arthur J. Rees (1872-1942) was born in Australia but relocated to England when in his early twenties. He worked as a newspaperman and according to some sources also for a time for the Metropolitan Police. he was the author of many mystery novels. It is in most ways a typical English country house murder mystery. The Heredith family has lived for generations in a moated house dating to the 17th century. They came into possession of their estate during the English Civil War, in rather violent circumstances. One of their ancestors allegedly burnt the original house to the ground, with its Royalist owner inside. As a result there is believed to be a curse on the Heredith family. In 1918 the house is occupied by Sir Philip Heredith, his unmarried sister and his son and heir, known generally as Phil. Phil’s new wife also lives there, although not very happily. Mrs Heredith is used to the excitement of London and finds country life to be unbearably done. A house party has been arranged to cheer her up. The house party ends in murder. There are a number of possible suspects but since all the guests were having dinner at the time of the murder they all appear to have perfect alibis. As luck would have it a Scotland Yard man, Detective Caldew, happens to be staying with his own family in the village. The ambitious young detective sees this as his great opportunity to make a name for himself but it soon becomes apparent that the case is beyond him. At first it also seems to be beyond Detective Superintendent Merrington who has been called in from the Yard to take charge. Merrington eventually solves the case and an arrest is made. But has the case really been solved? Phil Heredith does not believe it has and employs the famed private detective Grant Colwyn to investigate further. Colwyn finds that several vital clues have been overlooked, the most important being that the famous Heredith pearls are missing. Superintendent Merrington’s case is based on the assumption that the motive for the murder was jealousy but this new information suggests that robbery may have been the real motive, a circumstance that casts serious doubt on the Crown’s case against the accused. In a golden age detective novel you expect a fiendishly complex plot and the book certainly delivers on that score. The eventual solution to the murder is delightfully ingenious. In fact the identity of the murderer could have been deduced by psychological means, which is undoubtedly how a Hercule Poirot would have approached it. The problem with such a psychological approach is that it would not have explained how the murder was committed and it would have had the further disadvantage of running up against a cast-iron alibi. Grant Colwyn has no interest in psychology. His method is based on a painstaking and methodical accumulation of evidence and a dogged determination to chase up every possible lead. This approach might take longer but it does provide Colwyn with the vital evidence needed to build an unshakeable case. Having three detectives all trying to solve the case more or less individually is an interesting touch. Even more interesting is that Rees shows us how the personality of the detective can impact on his investigation and how this can often lead him astray. Rees has a straightforward but rather pleasing prose style, another factor in the book’s favour. be broken by the unravelling of a fantastically complicated murder then you should have a great deal of fun with this novel. In fact if you’re a fan of golden age detective stories in general you will find that this one ticks all the right boxes. Highly recommended.